MicroMatrices specializes in pathology-guided high resolution tissue analyses which can localize toxicological responses to different cell types within tissues. This level of analysis facilitates the design of in vitro screening models to assess the human relevance of mechanisms identified in vivo . 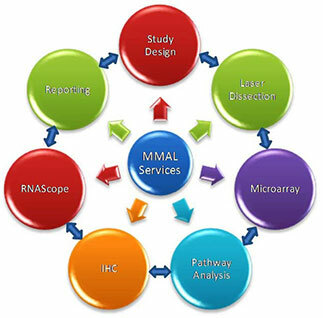 Services can be provided for either in vivo and in vitro toxicological models. We integrate conventional toxicity end-points, including in situ hybridisation (ISH), and histopathological data, quantitated via image analysis, with findings from transcriptomic/proteomic profiling. 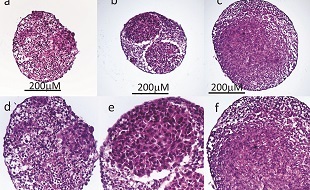 MicroMatrices have expertise in the extraction of RNA and protein from FFPE tissue and can perform integrated miRNA, mRNA and proteomic profiling studies; in addition, we can immunostain parallel sections of these same samples to localize toxicological responses to different cell types within the tissue. Using this approach in archived bioassay study samples unlocks the potential of historic samples by identifying potential biomarkers for future screening and mechanistic studies, minimizing the need for new animal experiments. on an interactive, step by step basis. Collaborations can begin with pilot projects which can then be scaled up to larger research programs, according to your requirements.